This is one of the most basic and simple Barbecue chicken wings recipe all the way from the deep South of America. It has subtle flavors of sweet and spicy, nothing too hot though. I think you will enjoy, his simple chicken recipe always go down a storm whenever we have a barbecue. First of all you need to wash he chicken wings. Sometimes they can get a little slimey if they have come form the local super market and that stops them from absorbing the marinade properly. Now find a big bowl and mix together all of the ingredients except for the oil and chicken. Stir well, you may need to heat it a little to get that honey fluid enough to mix in. If you don't have honey you can always use sugar. Add the chicken wings to the bowl and make sure that they are all covered with the marinade. If you don't have a bowl big enough you can pour everything into a bag and put it in the fridge. You need to marinade the chicken in the fridge over night or for at least 5 hours. The longer the better (up to a point of course). When the time comes, remove the chicken and then get rid of the marinade. Brush the chicken wings with a little of the olive oil and sear quickly on a high heat for a couple of minutes and then move them to a lower heat to cook for another 10 minutes. Check they are cooked and then serve with a nice salad and all the other stuff you have at a barbacue. 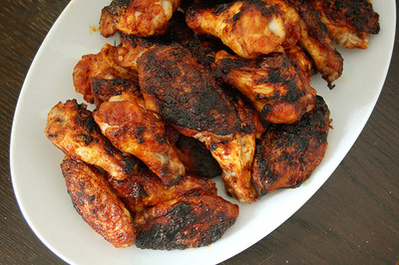 I hope you enjoy these simple barbacue chicken wings!